BE IT RESOLVED THAT, this shall be the policy of the Confederation until amended or overturned by subsequent resolution. This resolution was approved at an official meeting of the Confederation Council on August 30, 2016. 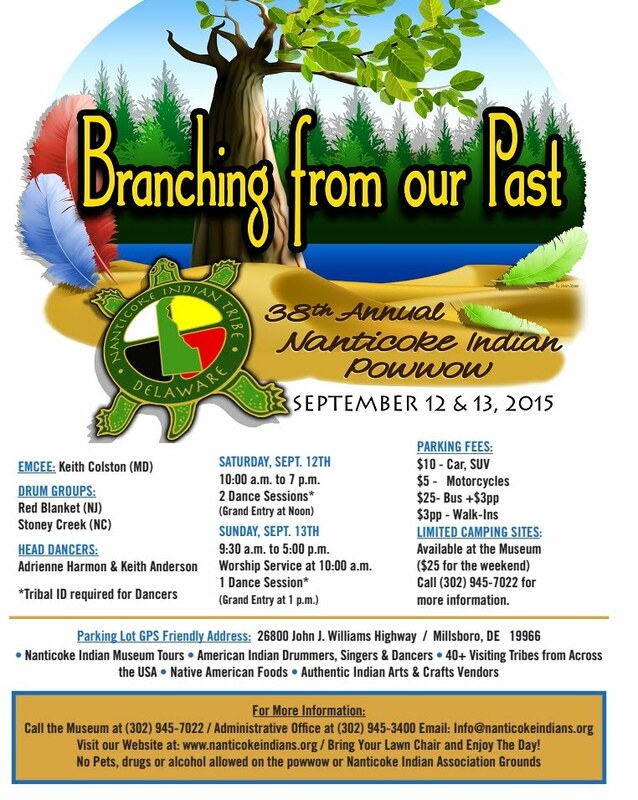 Our Pow Wow celebrates the culture and socializing of American Indians. It is a “living event” and not a “reenactment.” Public Pow Wows invite non-American Indian people to learn and enjoy the celebration, while also respecting the culture. 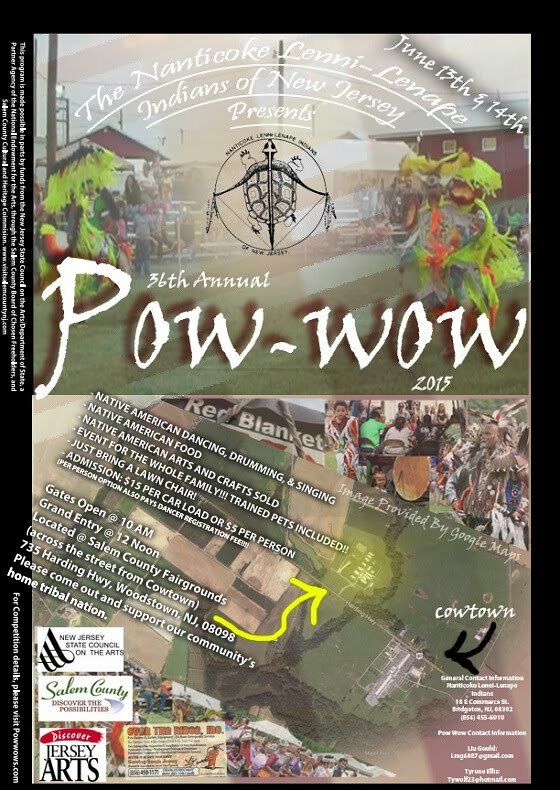 The Pow-wow is located on Route 40, just west of Sharptown in Pilesgrove Township, about 3 miles west of Woodstown in Salem County, NJ, and about 8 miles east of the Delaware Memorial Bridge. From the Delaware Memorial Bridge, look for Route 40 East to Atlantic City. Take Route 40 about 8 miles East, and the Pow-wow will be on your left. From Route 55, look for Route 40 West just North of Vineland. Take Route 40 West about 18 miles from Route 55, and the Pow-wow will be on your right. You will pass through Woodstown and Sharptown. The Cowtown rodeo grounds will be on your left before you reach the Pow-wow location on your right. 1. Dress and act appropriately. Immodest attire and profanity have no place at Pow Wows. Smoking near the Arena is considered disrespectful. Alcohol, recreational drugs and firearms are prohibited. 2. Respect the special seating reserved for dancers in regalia, elders and those with disabilities. Seats with blankets, shawls or regalia items on them are taken and should not be bothered. Unless you are sure spectator seating will be provided for the public, bring a chair. 4. Respect Mother Earth…. Don’t Litter… Put trash in a trash can. 5. Listen to the Master of Ceremonies. He will announce who is to dance and when. He will also inform spectators of proper protocol. Some dances are open to the public. 6. Do not touch a drum or sit at a drum without permission. Ask permission from the Head singer. 7. The Powwow committee reserves the right to require tribal identification cards from competition dancers. No one is permitted to compete without registering. 8. The traditional outfits worn by American Indians are not “costumes;” they are “regalia.” Regalia is an expression of spirit, and has been prayed over and blessed. Honor it, the person wearing it, and the living history it represents. Do not touch anyone’s regalia without their permission. 9. Tribal Powwows are not an outlet for the non-American Indian spectators to “play Indian.” Spectators should NOT be dressed in regalia. This is not a costume party. It is a celebration that respects the ancestors and the ways of American Indian People. 10. Tape recording of the drums should be done only after asking the drum group. Video recording should be only for personal use, unless by previous arrangement with the staff. 11. 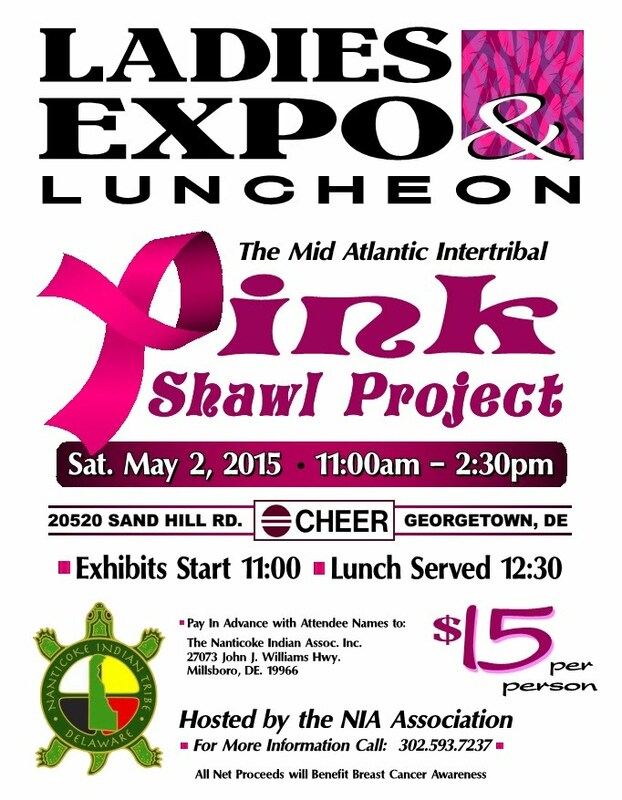 At any given powwow, you will find a wide array of Indian arts, handmade crafts, and jewelry for sale. Some may not accept checks, so it is a good idea to have cash on hand. Please use care when handling merchandise, and please watch your children! 12. HAVE A GREAT TIME!!! MAKE NEW FRIENDS AND WONDERFUL MEMORIES!!! The recent changes to the Part 83 Regulations on Federal Acknowledgement are aimed at making the process more transparent and consistent with the original intent when the process was created. Federal acknowledgment provides crucial legal protections and benefits to tribal governments and tribal citizens that are conducive to supporting inherent tribal sovereignty and cohesion. Federal acknowledgment does not "create" tribes that are not historic, nor does it impose restrictions on tribal citizens. Rather, it aids in perpetuating tribal identity, governance, and community into the future. Increasingly, and unjustifiably, federal regulations and programs are being reinterpreted in a manner that they are becoming exclusive to federally recognized tribes, leaving the future uncertain for non-BIA listed tribes. The recent changes to the process provide better accountability and transparency for worthy petitioners, and - hopefully - make the process less costly and time consuming. Rev. John Norwood (Nanticoke-Lenape) serves as the Confederation's Government Liaison and as the Co-Chairperson of the Task Force on Federal Acknowledgment of the National Congress of American Indians (NCAI) and has offered to answer questions and/or provide training on the issue to any of the member tribal governments upon request. 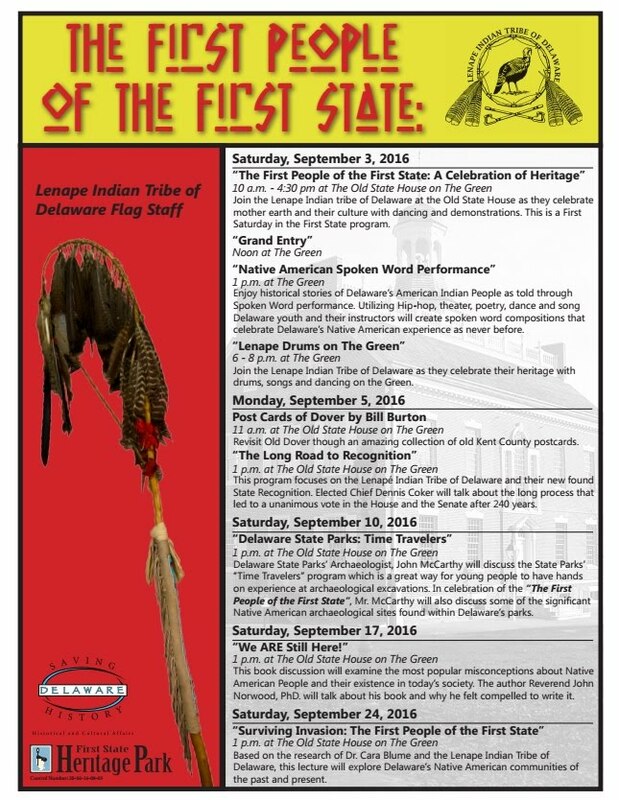 The Nanticoke Lenni-Lenape have filed a federal law suit against the State of New Jersey for attempting to rescind the longstanding recognition of the three state recognized tribes (which also include the Ramapough Lenape and Powhatan Renape). The lawsuit asserts that the state has undermined the status, protections, and benefits the tribes have enjoyed for over three decades because of an irrational fear of the development of casino gaming that could threaten New Jersey's gaming industry. This fear is based in a racist stereotype as the tribes have not attempted to establish casinos, and because state recognition does not allow for them. The Nanticoke Lenni-Lenape had successfully negotiated an admission that they were recognized and that the state would correct its error, only to have the Christy administration cut off communication prior to a final resolution. It was agreed that the Confederated Tribes would forward all public inquiries about the lawsuit to the lead attorney on the case. Chief Dennis Coker presented the Mid-Atlantic Region Council of the Oceans (MARCO) information regarding the upcoming Native outreach in August. Chief Coker has been the Confederation representative on regional environmental concerns, ensuring that the tribes have a voice and that information is disseminated to the tribal Chiefs. The NCAI request for support of the Tribal Labor Sovereignty Act was discussed and agreed to. NCAI passed a resolution in strong support at the recent Midyear meeting in St. Paul. A Confederation Leadership Conference was proposed in order to promote greater unity among the Confederated Tribes, improve and strengthen tribal governance, increase an understanding of the challenges facing tribes, and establish strategies for the future of our people. All government officials from each of the three member tribes would be invited, A separate workshop for young adults wold be conducted to promote a better understand of the confederation and tribal governance. It was determined that the first conference should be held in or near the Cheswold community, as it is a central location. * The next meeting will be held via conference call on Wednesday, September 16th, at 2pm. 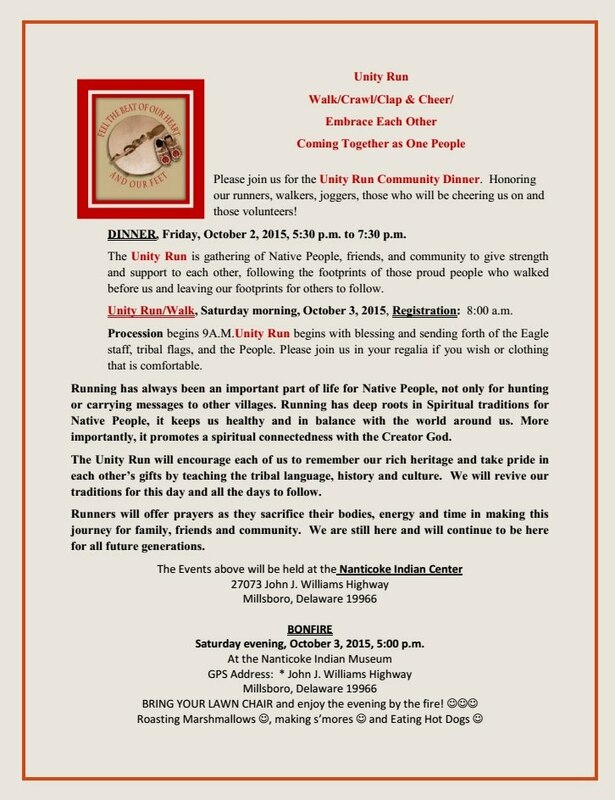 Call-in information will be distributed to the tribal chiefs. Delaware Bay area, the Confederation is urging its member tribes and their citizens to plan ahead in order to be prepared. Post the "Prepare" poster and distribute the Family Emergency Plan among the tribal citizenship.